Syniadau :: The Blog: Still "running rings around us"
1. We welcome the detailed report by the All Wales Convention and reaffirm Welsh Labour’s commitment to primary legislative powers for the Welsh Assembly (under Part 4 of the 2006 Act), and to campaign for these in a successful referendum. 2. Because a ‘No’ vote in a referendum could set back devolution for several decades, triggering the referendum process needs to be based on a firm prospect that public opinion is ready to respond positively in the referendum. 3. 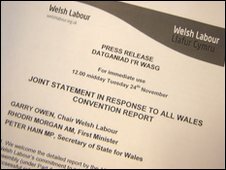 Our internal policy process has already begun: Welsh Labour’s Welsh Joint Policy Committee has met, prioritised the need to campaign for a General Election victory, and agreed to start considering the All Wales Convention report in detail as a prelude to stepping-up wider Party consultation with AMs and MPs, councillors, trade unionists and members as soon as the General Election is over. It is understood the wording of Mr Morgan's [subsequent] statement to AMs was agreed in an hour-long meeting between Mr Morgan, and the Plaid leader and Deputy First Minister Ieuan Wyn Jones in the morning, before the Labour news release was issued. So what was going on? Whatever else Rhodri might be, he is not stupid. His memory for detail is legendary. So why the contradictory statements? We can each draw our own conclusions. But the clear reaction to the earlier press statement was that Plaid would put the knife into Labour if they failed to honour their firm commitment in the One Wales agreement. So my guess is that Labour were either testing our resolve ... or that Peter Hain was making yet another of his last-ditch attempts to the scupper the referendum. As that other avid anti-devolutionist in the Labour ranks said last summer, Plaid are definitely "running rings around us". I think it's possible that Labour have simply run out of room to maneouver on this. As long as the Convention was "out" they could keep the issue on the backburner. Now it's come back in the affirmative, they have had to confront the issue. The timing is deeply suspect, with Hain due to make a cameo appearance in the Assembly tomorrow. I'm quietly impressed that IWJ has taken such a strong stand on this, but as Glyn Davies pointed out, he really had no choice in the matter. He had to. Why is it a surprise that Labour would wait until the UK election result before deciding this? Admittedly, when 'None-Wales' was cobbled together it was thought that that election would have been done and dusted. For people who know the way Labour works, there are always two absolutes: they want to keep the power in their hands no matter what the issue; they make collective decisions and members fall in line 'cause they depend on party patronage. Sorry, Plaid still doesn't get that, which is a recipe for political weakness.